Yope soaps are inexpensive and 92% organic.They are made in Poland with a passion for naturally beautiful and innovative aromas. Safe and healthy for all skin types (including young children), these liquid soaps are nicely scented and do not contain any enhancing substances such as Sodium Lauryl Sulfate (SLS) and Sodium Laureth Sulfate (SLES). Yope Verbena Natural Liquid Soap has antibacterial properties and a high vegetable glycerine content, which work to keep your skin soft, smooth and moisturised. It is made with 92% natural ingredients and contains extract from the leaves of common verbena. Scent characteristics: citrus, soft cologne, fresh. Soothes irritation & accelerates skin regeneration. Free from parabens, silicones, colorants, SLESs & SLSs. Yope Verbena Natural Liquid Soap has a soft and citrusy aroma that gives the feeling of freshness and improves your Mood. This soap also contains Vitamin B5 and allantoin which soothes irritation and accelerates skin regeneration. Yope Honey & Bergamot Kitchen Hand Soap has been made with 92% natural skin nourishing ingredients, such as antibacterial Honey and moisturising bergamot. This soap also contains Vitamin B5 and allantoin which soothes irritation and accelerates skin regeneration. Scent characteristics: refreshing, sweet & appetising. Contains vitamin B5 & allantoin to soothe irritation & accelerate skin regeneration. Other than aforementioned active ingredients, Yope Honey & Bergamot Kitchen Hand Soap also contains a specially designed vegetable additive that is both neutral for your skin and the environment. This vegetable element accelerates the decomposition of volatile particles with unpleasant aroma and transforms them into odourless particles. Yope Vanilla & Cinnamon Natural Liquid Soap has anti-inflammatory and rejuvenating properties, which work to keep your skin soft, smooth and moisturised. It is made with 92% natural ingredients, which includes extracts from Cinnamon bark and Vanilla Pods. Scent characteristics: spicy, sweet, tasty. 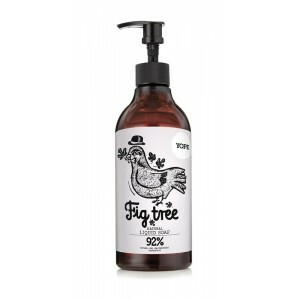 Yope Fig Tree Natural Liquid Soap is a fresh and fruity sweet hand soap made with natural fig extract, which helps skin cells fight harmful free radicals. This soap also contains Vitamin B5 and allantoin which soothes irritation and accelerates skin regeneration. Scent characteristics: fruity, sweet + fresh. Vitamins B & C + valuable microelements moisturise & regenerate skin. A high vegetable glycerine content keeps skin smooth, elastic & moisturised. Other than aforementioned active ingredients, Yope Fig Tree Natural Liquid Soap also contains a specially designed vegetable additive that is both neutral for your skin and the environment. This vegetable element accelerates the decomposition of volatile particles with unpleasant aroma and transforms them into odourless particles.